The username and/or password is invalid. Try again. Account number not recognized, please try again. If you have already signed up for the Local Marketing Group (LMG), be aware that changes submitted through this portal DO NOT automatically pull through to your landing page on MyHeatingCoolingPros.com. 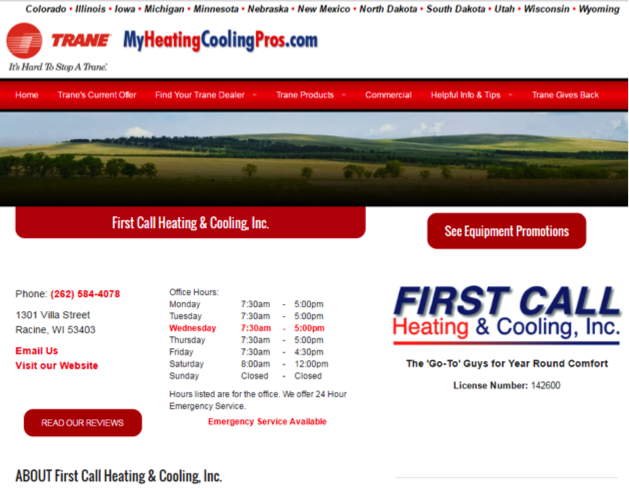 CLICK HERE to make changes to your landing page on MyHeatingCoolingPros.com. 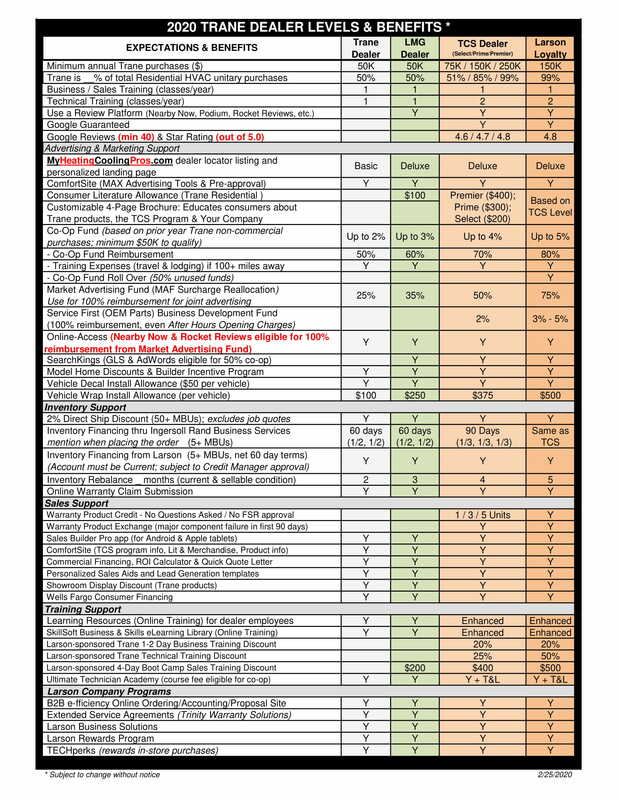 Below are the 2019 Trane Non-Commercial Purchase and Total Trane Purchase Goals for your company based on actual purchases in 2016 and 2017 and projected purchases for 2018. Review your goals and, if you agree these are reasonable and achievable, electronically sign at the bottom of this page. If not, please discuss with your Larson Sales Consultant and enter revised numbers based on goals that you are comfortable with. If you expect that your company is going to significantly increase or decrease it’s Trane purchases in 2019, this information and conversation with your SC will allow our team to follow our internal process to ensure we have the correct inventory at your local branch to ensure timely order fulfillment. Company Logo: Here is the logo we have on file for your company. If this is incorrect or no logo is shown, please upload/update your logo. Note: Please review & update all fields on this page, as this is the information the Gustave A. Larson Company will use. ('Dealer') and the Gustave A. Larson Company ('Larson') enter into the following agreement in order to grow the Trane residential product line in a manner profitable to both parties. This agreement is effective from the moment it is signed or accepted electronically by the Dealer and remains effective until it is terminated by either party as set forth below. • Allow Larson to email, fax, and/or mail information about products, programs, training, etc. 1. Represent himself at all times, whether in writing or otherwise, as an 'independent' dealer, and shall not represent himself as an authorized agent or franchise or to make commitments, statements, or contracts on behalf of Larson or Trane. Dealer shall ensure that all non-Trane products or services offered by or through Dealer shall be clearly and explicitly identified as a Dealer or third party product or service so that such products or services are not construed by a customer to be a Trane offering or obligation. 2. Prominently identify each Dealer location as a source of Trane products and actively promote, market, and sell the products in a manner to enhance the prestige of their brand name, and not to disparage or devalue Trane name, trademark or reputation in any way. 3. Comply with Trane's standards, guidelines and branding specifications for the advertisement of Trane products and for use of any Trane trademarks associated therewith. 4. If Dealer elects to place any Trane trademark on its vehicles, signage or on the uniforms of its employees or the like, Dealer shall do so in accordance with Trane's programs and standards therefore, and shall ensure that a clean and professional image is presented thereto. Additionally, Dealer agrees that Larson shall have the right, at least once during the term of this Agreement or annually, whichever is shorter, to visit the premises of Dealer for purposes of inspecting such premises and Dealer's vehicles and employee uniforms to ensure that any use of Trane trademarks is in accordance with Trane's guidelines and standards and to ensure that a clean and professional image is presented by Dealer in its dealings as a Dealer of Trane products. Dealer further agrees that: (i) it will do nothing that will in any way impair, damage, or dilute Trane's ownership, value, or control of its trademarks and trade names, (ii) it will not use the name 'Trane' to indicate in any way that Trane has any ownership interest in Dealer; (iii) it will not use the name 'Trane' or any portion or variation of it in Dealer's legal, trade, or business name, commercial name, trademark, website URL, chamber of commerce or similar register; (iv) any and all use of Trane's trademarks by it shall inure to the sole and exclusive benefit of Trane; (v) nothing shall confer or vest in Dealer any right of ownership or use of any Trane trademark, other than as specified herein; and (vi) its rights herein are subject to termination for any failure to comply or to correct any misuse of Trane trademarks as noted by Larson or Trane. 5. Not misrepresent the capabilities or benefits of the Products to the consumer in any manner. The Dealer further agrees to train its personnel, agents, and/or representatives in the use of Trane approved selling stories, which will be made available to Dealer by Larson and Trane. 6. Hold all necessary Federal, State and local licenses/permits to sell, install and/or service Trane products throughout the term of this agreement. 7. Not sell Trane products on an uninstalled basis, either directly or through a third party, and not sell to another contractor for installation. In the event of a breach of this provision, Dealer agrees herein that it will reimburse Trane for any reasonable costs involved in remedying issues that arise with Products in violation of this provision. 8. Take responsibility for delivering Product warranties, Product Use and Care books, and other consumer literature packaged with the Products to the purchaser and/or consumer and for complying with specific product registration procedures including, but not limited to, limited warranties, as may be required by Trane and shall indemnify Trane for any failure to deliver Product warranties, Product Use and Care books and other consumer literature to the purchaser and/or consumer or for failure to comply with product registration procedures. Dealer further agrees to make sure to the best of its ability that the purchaser and/or consumer understand the operation of the Products, maintenance requirements and warranties. 9. Comply with all federal, state, and local, laws, rules, regulations, orders, codes, and ordinances and accepted industry practices, directly or indirectly governing the sale, installation, service, repair and/or disposal of Product, and to maintain all necessary permits, licenses, or certifications required by local or state authorities. 10. Maintain a stock of inventory of Products and related parts, as Dealer and Larson deem appropriate, to adequately meet the needs of its customers in a timely fashion. 11. Ensure that installation, service, repair, and customer site visits will only be performed by employees who have passed sufficient background checks. 12. Not remove, disconnect or negate any safety device or features on Products. Dealer shall not to remove or alter any labels, plates, or tags attached to Products without the prior written instruction or consent of Trane and/or Larson. 13. Understand that Larson and Trane may from time to time use homeowner information, pursuant to Trane's privacy policies, to confirm proper sales or service of its Products including, but not limited to, the following: (1) to ensure Trane's programs are provided and proper quality in service is achieved; (2) to evaluate a homeowner's reactions to an interest in Trane products and services; (3) to conduct research activities; (4) to respond to a homeowner request; and (5) to comply with all laws, rules, regulations, and orders. 14. Acknowledge that it may be provided with or come into possession of Trane's confidential or proprietary information and agree that confidential or proprietary information is provided for the sole purpose of permitting the Dealer to function as an independent Trane dealer and to promote the Products and services. Dealer agrees to maintain the confidentiality of all confidential, proprietary and trade secret information, including but not limited to pricing data and marketing plans. Upon termination or expiration of this Agreement, Dealer shall, at Trane's option, immediately return to Trane all confidential or proprietary information or destroy it and certify to Trane of such destruction. i. For all Products or systems (except the XL/XLi/XV or XC Products or systems), Dealer shall service, repair, and/or install all Products as part of the repair free of any labor charges to the consumer or Trane for a period of one (1) year from the date of installation of the Products. ii. For XL/XLi/XV or XC Products or systems, Dealer shall service, repair, and/or install such Products as part of the repair free of any labor charges to the consumer or Trane for a period of two (2) years from the date of installation of the Products. iii. 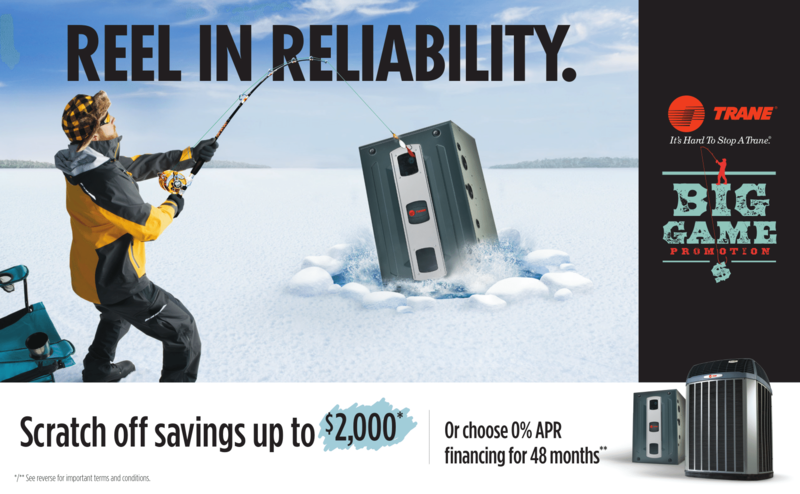 Trane will supply all warranty parts free of charge to the Dealer for the length of the published warranty for the applicable part(s). If the Dealer cannot repair the Products to the proper working order, Trane shall have a right to send a qualified contractor to repair the Products at Dealer's expense and Dealer agrees to reimburse Trane for any such charges. iv. Dealer acknowledges that Dealer's failure to comply with the Product warranty and the Dealer's obligations herein may void the Product warranty, and Dealer agrees to assume all costs associated with remedying the Products. Additionally, Dealer agrees to ensure that warranty claim submissions are valid and proper and agrees that claim approvals are made solely by Trane. In the event of any improper submissions, Trane shall have the right to immediately chargeback Dealer for any payments made on such claims and Dealer agrees not to seek payment from a consumer for any such chargebacks. 16. 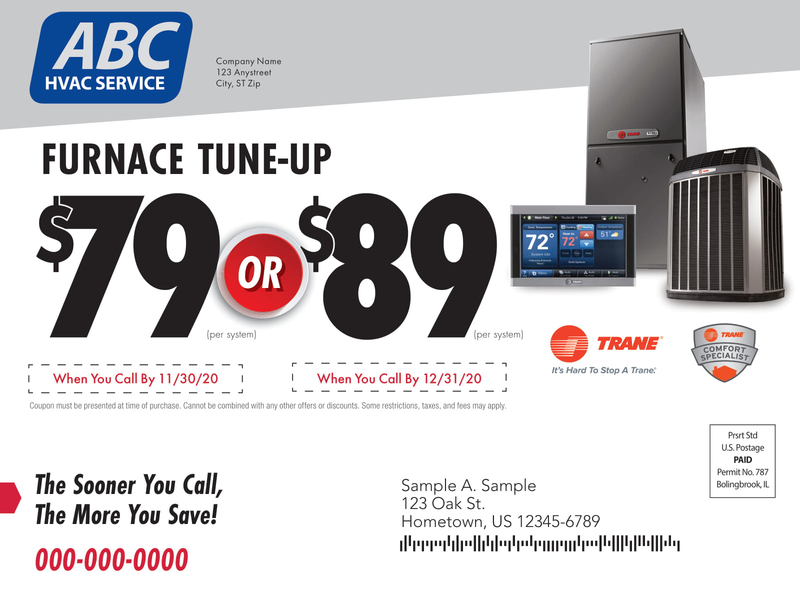 Maintain a complete record of Trane's products sold by the Dealer (including model and serial number, name and address of purchaser, and date of the purchase and installation) for 12 years, and to furnish such data to Trane and/or Larson upon request of either party, free of charge, in order to facilitate the locating of products in the possession of users in the case of product safety or performance issues. Additionally, Dealer agrees to furnish, free of charge, such relevant documents or records to Trane and/or Larson to assure compliance with its obligations as a dealer and compliance with the various programs or plans for which Dealer participates. If an audit is conducted by Trane or Distributor and that audit reveals that Dealer is not performing in material compliance thereto then, in addition to any other legal and equitable rights and remedies available. Dealer will reimburse Trane for the reasonable and customary costs of the audit. 17. Promptly report to Larson and Trane any incident where products are alleged to have caused property damage or personal injury and provide prompt and full cooperation in response to Trane's request for action on matters relating to consumer product safety issues. 18. Defend, indemnify, and hold harmless Trane and Larson and their respective parent companies, subsidiaries, affiliates, directors, officers, employees, and agents from and against any and all third party claims, losses, liabilities, penalties, damages, lawsuits, judgments, liens, encumbrances, costs, or expenses including, but not limited to, reasonable attorneys' fees, arising in whole or in part out of the acts or omissions or willful misconduct of the Dealer or Dealer's breach of this Agreement. 19. Understand and agree that it is not a party to and has no legal interest in or benefit from extended warranty agreements offered or sold by Trane which are agreements between Trane or its affiliate and the consumer. 20. Dealer and Larson shall each have a right to terminate any dealer agreement with or without cause upon thirty (30) days written notice and no party may seek compensation or any other remedy for an expected or hoped for continuation of the agreement. 21. Understand and agree that any dealer agreement may be terminated upon one (1) days' notice if Dealer commits any act or engages in any conduct which Impairs, harms or disparages Larson's and/or Trane's name, trademarks, products or reputation and that such termination shall terminate the Dealer's right to purchase and sell Trane product. 22. Dealer acknowledges that any continued use of the trademarks after the expiration or termination of this Agreement will result in immediate and irreparable harm to Trane for which there is no adequate remedy at law. In such a case, Trane shall be entitled to equitable and monetary relief, including but not limited to a temporary restraining order, preliminary and permanent injunction, specific performance with respect to any further violations of Trane's rights attorney and other professional fees incurred to enforce its rights in its trademarks, and monetary damages in the amount of $10,000 per month until any unauthorized use of its trademarks cease. Dealer understands that any rights to sell Trane products will not expire unless terminated by either party as set forth below. 23. Dealer and Larson shall each have a right to terminate any dealer agreement with or without cause upon thirty (30) days' written notice and no party may seek compensation or any other remedy for an expected or hoped for continuation of the agreement. Upon termination or non-renewal of this agreement, all support and benefits from Larson to the dealer shall immediately cease. The Dealer shall immediately cease its renewal of Yellow Pages ads that identify the dealer with 'Trane', its trade name or trademarks, and will have thirty(30) days to remove from its premises and vehicles all signs, insignia, and other sales promotional material displaying any trade name or trademark of Trane and to discontinue all use of any such trade name or trademark. 24. This is non-exclusive. Larson reserves the right to market its products and establish additional dealers as it determines necessary. 25. Trane/Larson reserves the right to amend or modify any affiliated programs or incentives at any time. 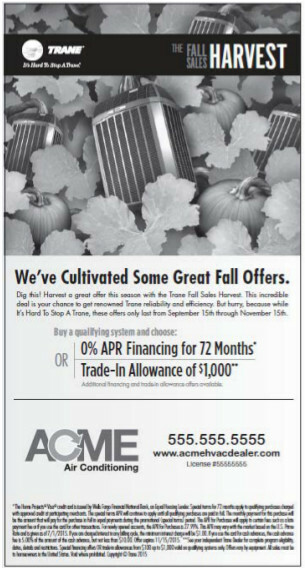 ('Registered Dealer') and the Gustave A. Larson Company ('Larson') enter into the following agreement in order to grow the Trane product line in a manner profitable to both parties. This agreement is effective from the moment it is signed or accepted electronically by the Registered Dealer and remains effective until terminated by either party as set forth below. 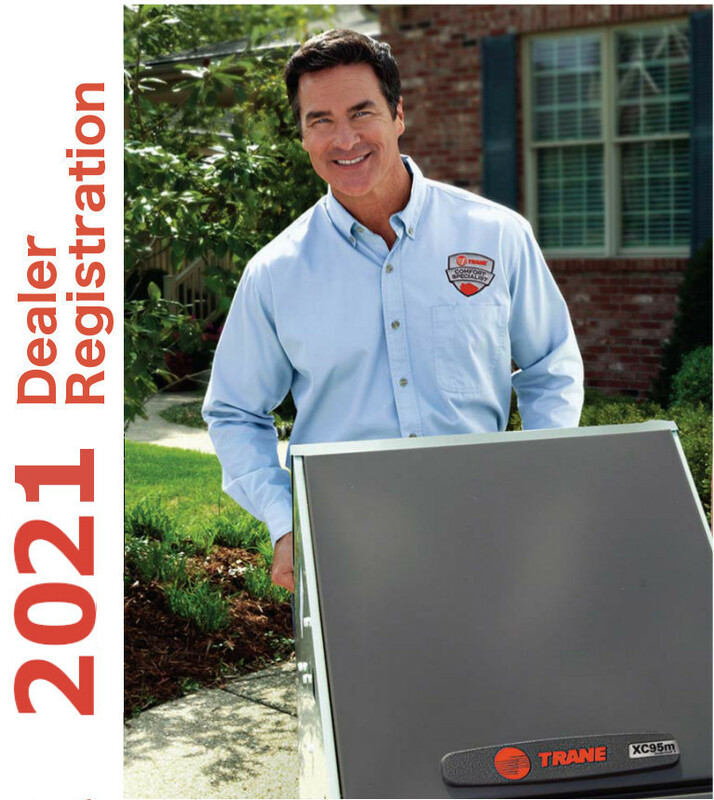 • Actively identify as a Trane Registered Dealer in at least one of the following: Business Cards, Proposal Forms, Uniforms, Truck Decals, etc. • Based on my business focus, my company will not receive accruals or promotional discounts, and is not eligible to participate in any consumer promotions and/or incentive programs. 1. Represent himself at all times as an 'independent' dealer, and shall not represent himself as an authorized agent or franchise or to make commitments, statements, or contracts on behalf of Larson or Trane. Dealer shall ensure that all non-Trane products or services offered shall be clearly and explicitly identified as a Dealer or third party product or service so that such products or services are not construed by a customer to be a Trane offering or obligation. 2. Not disparage or devalue the Trane name, trademark or reputation in any way. 3. Not misrepresent the capabilities or benefits of the Products to the consumer in any manner. 5. Not sell Trane products on an uninstalled basis. In the event of a breach of this provision, Dealer agrees herein that it will reimburse Trane for any reasonable costs involved in remedying issues that arise with products in violation of this provision. 6. Be responsible for delivering Product warranties, Product Use and Care books, and other consumer literature packaged with the Products to the purchaser and/or consumer and for complying with specific product registration procedures including, but not limited to, limited warranties, as may be required by Trane and shall indemnify Trane for any failure to deliver Product warranties, Product Use and Care books and other consumer literature to the purchaser and/or consumer of for failure to comply with product registration procedures. Dealer further agrees to make sure to the best of its ability that the purchaser and/or consumer understand the operation of the Products, maintenance requirements and warranties. 7. Comply with all federal, state, and local, laws, rules, regulations, orders, codes, and ordinances and accepted industry practices,directly or indirectly governing the sale, installation, service, repair and/or disposal of Product, and to maintain all necessary permits, licenses, or certifications required by local or state authorities. 10. Understand that Larson and Trane may from time to time use homeowner information, pursuant to Trane's privacy policies, to confirm proper sales or service of its Products including, but not limited to, the following: (1) to ensure Trane's programs are provided and proper quality in service is achieved; (2) to evaluate a homeowner's reactions to an interest in Trane products and services; (3) to conduct research activities; (4) to respond to a homeowner request; and (5) to comply with all laws, rules, regulations, and orders. 11. Acknowledge that it may be provided with or come into possession of Trane's confidential or proprietary information and agree that confidential or proprietary information is provided for the sole purpose of permitting the Dealer to function as an independent Trane Dealer and to promote the Products and services. Dealer agrees to maintain the confidentiality of all confidential, proprietary and trade secret information, including but not limited to pricing data and marketing plans. Upon termination or expiration of this Agreement, Dealer shall, at Trane's option, immediately return to Trane all confidential or proprietary information or destroy it and certify to Trane of such destruction. i. 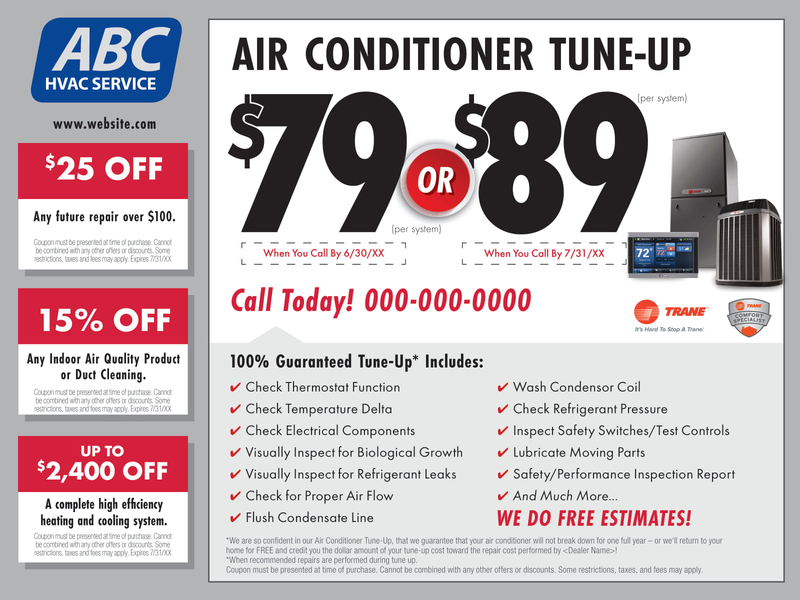 For all products/systems (except the XL/Xli/XV or XC Products or systems): Service or repair free of any labor charges to the consumer or Trane for a period of one (1) year from the date of installation of the Products. ii. For XL/XLi/XV or XC Products or systems: Service or repair free of any labor charges to the consumer or Trane for a period of two (2) years from the date of installation of the Products. iv. Acknowledge that Dealer's failure to comply with the Product warranty and the Dealer's obligations herein may void the Product warranty, and agree to assume all costs associated with remedying the Products. Dealer agrees to ensure that warranty claim submissions are valid and proper and agrees that claim approvals are made solely by Trane. In the event of any improper submissions, Trane shall have the right to immediately chargeback Dealer for any payments made on such claims and Dealer agrees not to seek payment from a consumer for any such chargebacks. 13. 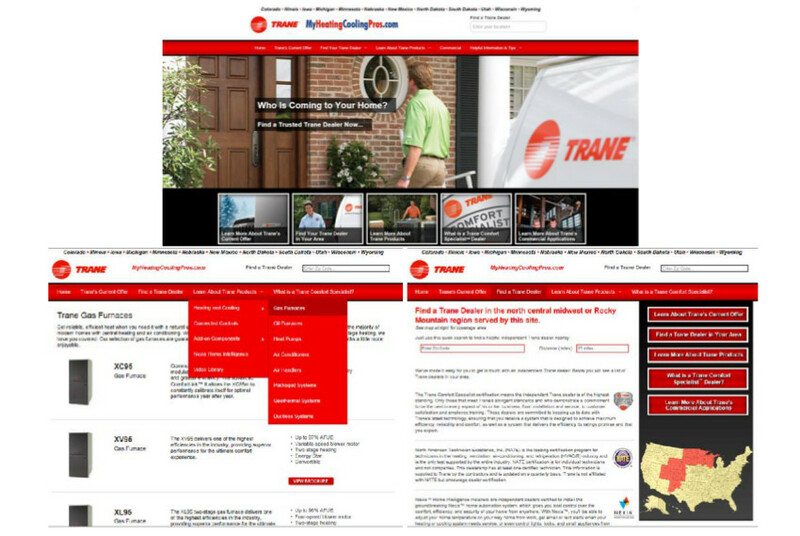 Maintain a complete record of Trane's products sold (including model and serial number, name and address of purchaser, and date of purchase and installation) for 12 years, and to furnish such data and relevant documents to Trane and/or Larson, upon request of either party, free of charge, in order to facilitate the locating of products in the possession of users in the case of product safety or performance issues. If and audit is conducted by Trane or Distributor and that audit reveals that Dealer is not performing in material compliance thereto then, in addition to any other legal and equitable rights and remedies available, Dealer will reimburse Trane for the reasonable and customary costs of the audit. 14. Promptly report to Larson and Trane any incident where products are alleged to have caused property damage or personal injury and give prompt and full cooperation in response to Trane's request for action on matters reasonably identified as relating to consumer product safety issues. 15. Defend, indemnify, and hold harmless Trane and Larson and their respective parent companies, subsidiaries, affiliates, directors, officers, employees, and agents from and against any and all third party claims, losses, liabilities, penalties, damages, lawsuits, judgments, liens, encumbrances, costs, or expenses including, but not limited to, reasonable attorneys' fees, arising in whole or in part out of the acts or omissions or willful misconduct of the Dealer or Dealer's breach of this Agreement. 16. Understand and agree that it is not a party to and has no legal interest in or benefit from extended warranty agreements offered or sold by Trane which are agreements between Trane or its affiliate and the consumer. i. It will do nothing that will in any way impair, damage, or dilute Trane's ownership, value, or control of its trademarks and trade names. ii. It will not use the name 'Trane' to indicate in any way that Trane has any ownership interest in Dealer. vi. Its rights herein are subject to termination for any failure to comply or to correct any misuse of Trane trademarks as noted by Larson or Trane. 18. Dealer and Larson shall each have a right to terminate any dealer agreement with or without cause upon thirty (30) days written notice and no party may seek compensation or any other remedy for an expected or hoped for continuation of the agreement. Upon termination of this agreement, all support and benefits from Larson to the Dealer shall immediately cease. 19. Understand and agree that any Dealer agreement may be terminated upon one (1) day's notice if Dealer commits any act or engages in any conduct which impairs, harms or disparages Larson's and/or Trane's name, trademarks, products or reputation and that shall terminate the Dealer's right to purchase and sell Trane product. 20. Dealer acknowledges that any continued use of the trademarks after the expiration or termination of this Agreement will result in immediate and irreparable harm to Trane for which there is no adequate remedy at law. In such a case, Trane shall be entitled to equitable and monetary relief, including but not limited to a temporary restraining order, preliminary and permanent injunction, specific performance with respect to any further violations of Trane's rights attorney and other professional fees incurred to enforce its rights in its trademarks, and monetary damages in the amount of $10,000 per month until any unauthorized use of its trademarks cease. Dealer understands that any rights to sell Trane products will not expire, unless otherwise earlier terminated. Dealer and Larson shall each have a right to terminate any dealer agreement with or without cause upon thirty (30) days' written notice and no party may seek compensation or any other remedy for an expected or hoped for continuation of the agreement. 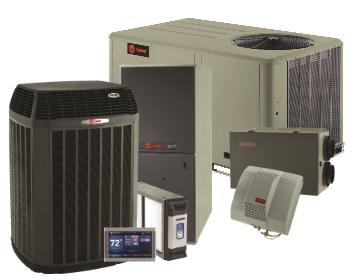 (RNC/MF Dealer) and the Gustave A. Larson Company ('Larson') enter into the following agreement in order to grow the Trane residential product line in a manner profitable to both parties. This agreement is effective from the moment it is signed or accepted electronically by the RNC/MF Dealer and remains effective until terminated by either party as provided below. 1. Represent at all times as an 'independent' dealer, and shall not represent as an authorized agent or franchise or to make commitments, statements, or contracts on behalf of Larson or Trane. Ensure that all non-Trane products or services offered shall be clearly and explicitly identified as a Dealer or third party product or service so that such products or services are not construed by a customer to be a Trane offering or obligation. 4. Hold all necessary Federal, State and local licenses/permits to sell, install and/or service Trane products throughout the term of this agreement. 6. Be responsible for delivering Product warranties, Product Use and Care books, and other consumer literature packaged with the Products to the purchaser and/or consumer and for complying with specific product registration procedures including, but not limited to, limited warranties, as may be required by Trane and shall indemnify Trane for any failure to deliver Product warranties, Product Use and Care books and other consumer literature to the purchaser and/or consumer or for failure to comply with product registration procedures. Dealer further agrees to make sure to the best of its ability that the purchaser and/or consumer understand the operation of the Products, maintenance requirements and warranties. 7. Comply with all federal, state, and local, laws, rules, regulations, orders, codes, and ordinances and accepted industry practices, directly or indirectly governing the sale, installation, service, repair and/or disposal of Product, and to maintain all necessary permits, licenses, or certifications required by local or state authorities. 8. Ensure that installation, service, and repair, and customer site visits will only be performed by employees who have passed sufficient background checks. 9. Not remove, disconnect or negate any safety device or features on Products. Dealer shall not to remover or alter any labels, plates, or tags attached to products without the prior written instruction or consent of Trane and/or Larson. i. 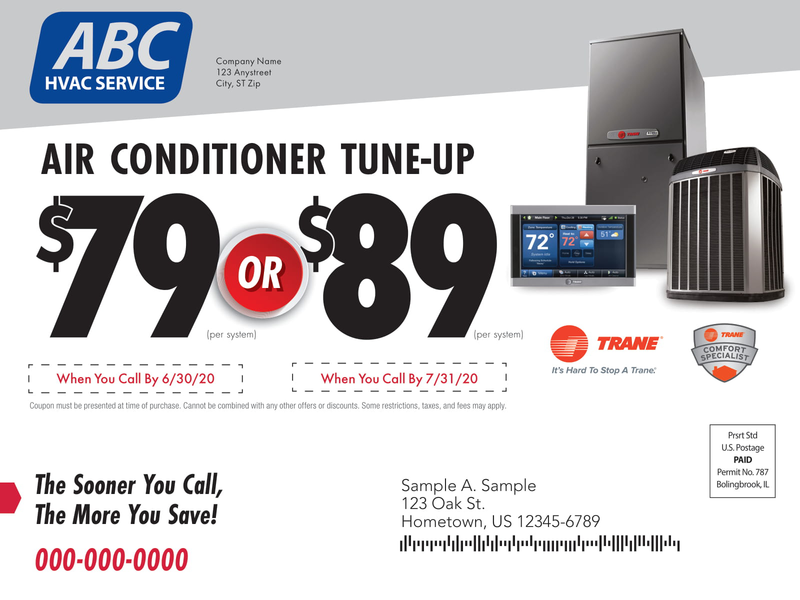 For all Products or systems (except the XL/XLi/XV or XC Products or systems): Service or repair free of any labor charges to the consumer or Trane for a period of one (1) year from the date of installation of the Products. 13. Maintain a complete record of Trane's products (including model and serial number, name and address of purchaser, and date of purchase and installation) for 12 years, and to furnish such data and relevant documents to Trane and/or Larson, upon request of either party, free of charge, in order to facilitate the locating of products in the possession of users in the case of product safety or performance issues. If and audit is conducted by Trane or Distributor and that audit reveals that Dealer is not performing in material compliance thereto then, in addition to any other legal and equitable rights and remedies available, Dealer will reimburse Trane for the reasonable and customary costs of the audit. 19. Understand and agree that any dealer agreement may be terminated upon one (1) days' notice if Dealer commits any act or engages in any conduct which impairs, harms or disparages Larson's and/or Trane's name, trademarks, products or reputation and that shall terminate the Dealer's right to purchase and sell Trane product. 20. Dealer acknowledges that any continued use of the trademarks after the expiration or termination of this Agreement will result in immediate and irreparable harm to Trane for which there is no adequate remedy at law. In such a case, Trane shall be entitled to equitable and monetary relief, including but not limited to a temporary restraining order, preliminary and permanent injunction, specific performance with respect to any further violations of Trane's rights attorney and other professional fees incurred to enforce its rights in its trademarks, and monetary damages in the amount of $10,000 per month until any unauthorized use of its trademarks cease. Dealer understands that any rights to sell Trane products will not expire unless terminated by either party as set forth below. Dealer and Larson shall each have a right to terminate any dealer agreement with or without cause upon thirty (30) days' written notice and no party may seek compensation or any other remedy for an expected or hoped for continuation of the agreement. I understand that by checking this checkbox, I am acknowledging and agreeing to the terms outlined in this agreement document. I also understand that checking this box and clicking the next button constitutes an e-signature that will be documented with GA Larson to show that I have received and agreed to these terms. Thank you for e-signing the Dealer Sales Agreement. You will receive a confirmation email shortly. You are done with the process and may now close this window.Press the NEXT button to continue the process. 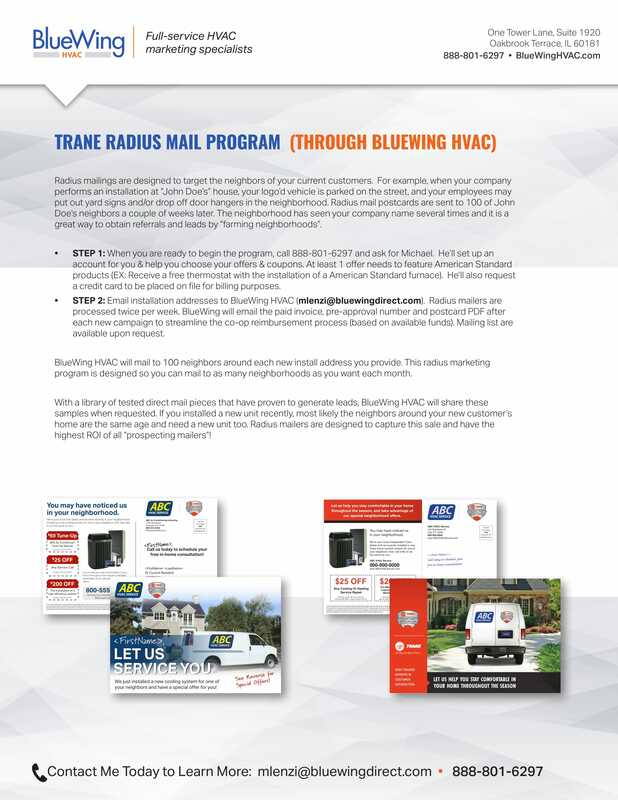 This program is available to selected Trane dealers in the Gustave A. Larson Company's authorized Trane territory that enroll in the 2019 TCS Program. To participate in this program, we ask for 99% of your company's directable* HVAC equipment (including branded accessories) and OEM parts business, plus the opportunity to earn your company’s HVAC aftermarket parts, accessories and supplies purchases. Thank you for e-signing the Larson Loyalty Agreement. Our records indicate that this was signed on . If you are submitting this for the first time, you will receive a confirmation email with a PDF of your 2018 Larson Loyalty Agreement. 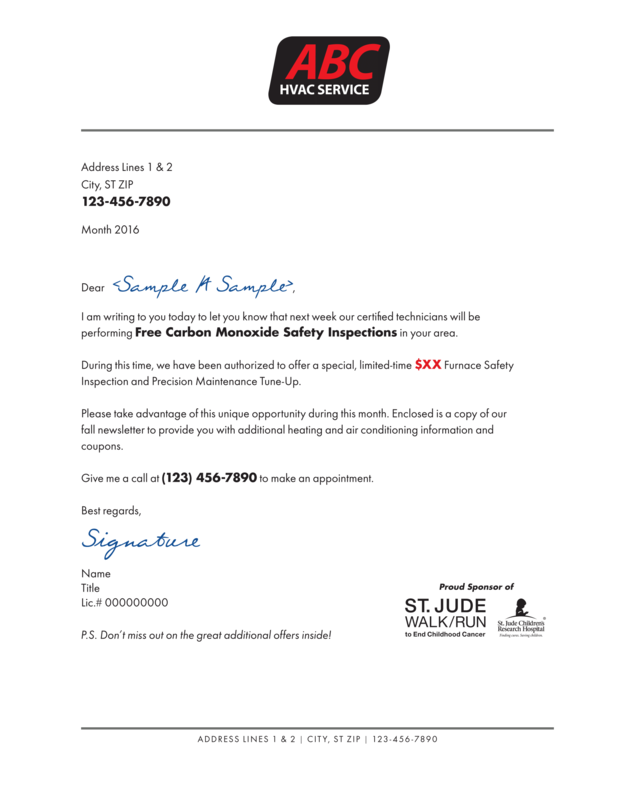 If you do not receive an email, please contact your Sales Consultant. 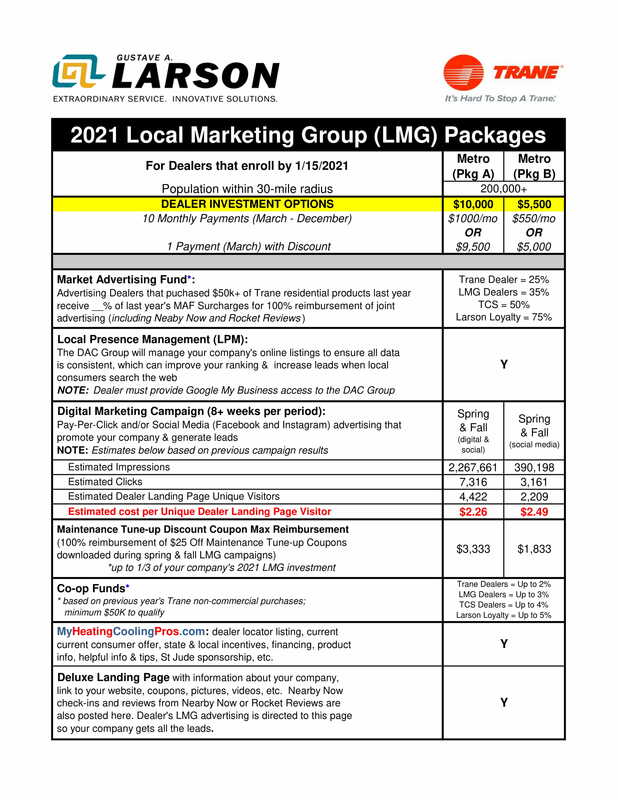 Press NEXT button to continue to see the LMG (Local Marketing Group) Program. Option 1: Select one of the LMG packages that we have carefully crafted for your convenience to best suit your budget and goals. 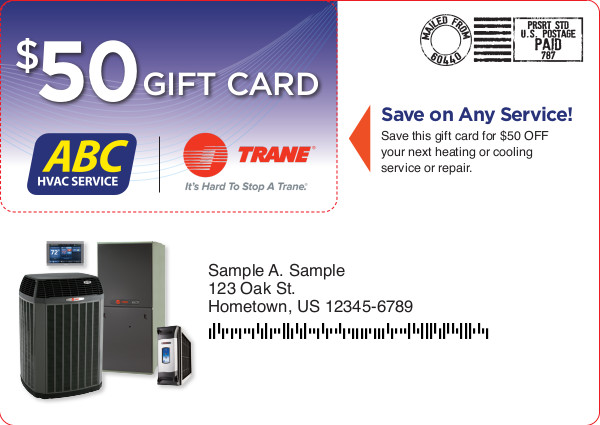 Option 2: Control Your Own Advertising - A TCS dealer with a full-time marketing employee or agency partner that commits to invest $5,000+ to jointly advertise their company and Trane in 2019. For this commitment, they will receive all the benefits listed above except the Pay-per-click and Social Media lead generation advertising campaign. 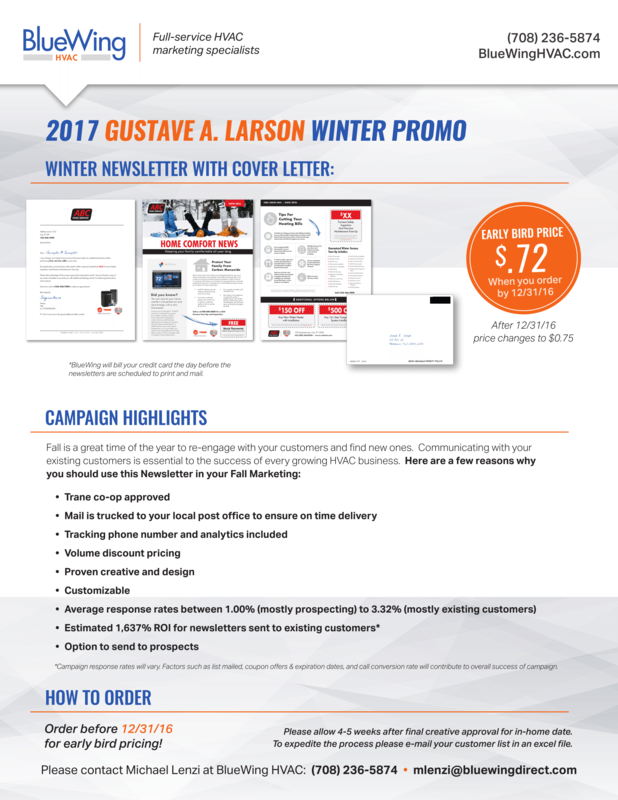 Opt Out: My company is not participating in the Gustave A. Larson Company's 2019 LMG Program. 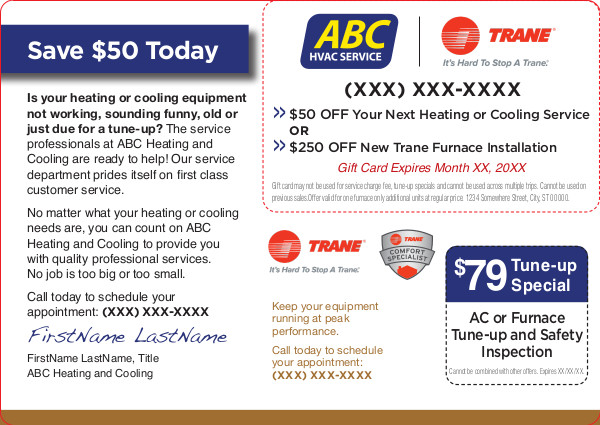 A Market Advertising Fund will be applied to all Trane non-commercial purchases. My company will earn up to a 2% Co-op Fund in 2019 on Trane non-commercial purchases (minimum $50,000 Trane purchases in 2018 to qualify) and can participate in Trane national consumer offers, but is not eligible to participate in the Seasonal Sales Incentive Programs or G.A. Larson sponsored consumer offers or veteran programs. Media opportunities are unlimited, budgets are limited. The solution? 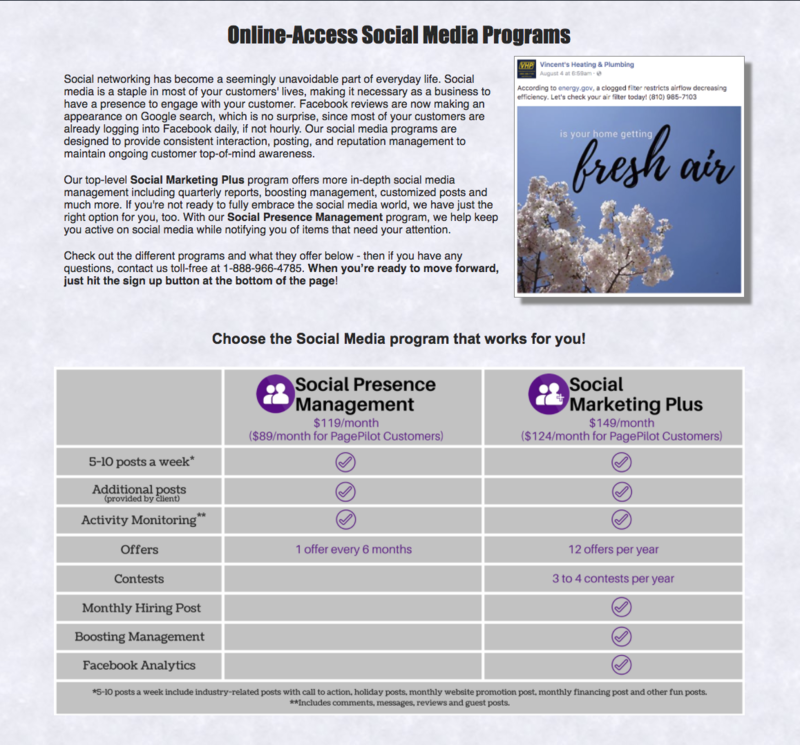 Participate in the Larson Company's LMG Program and select the Package that best suits your budget and goals to receive Social Media (Facebook and Instagram) advertising that promotes your company and Trane. 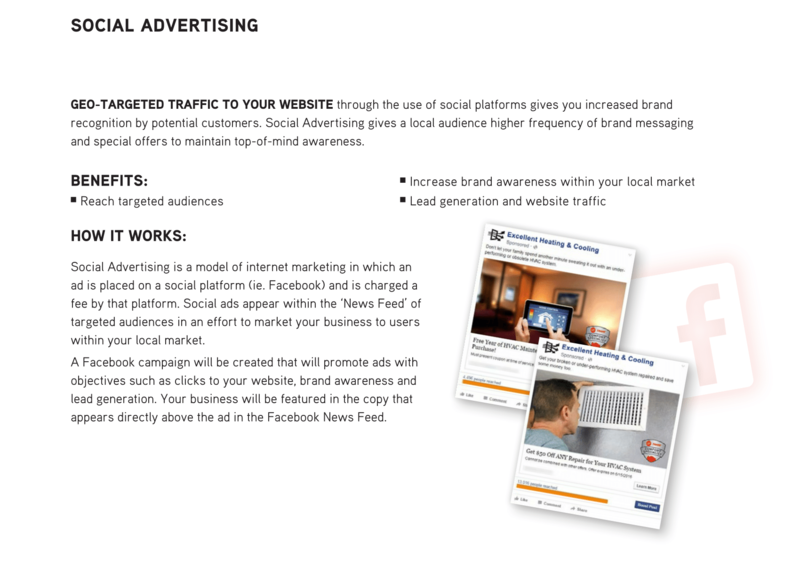 City and Metro participants will also receive Ad Words (pay-per-click) advertising to generate leads plus increased online visibility. Some packages also offer Bonus Advertising Funds that are reimbursed at 100% for pre-approved advertising. 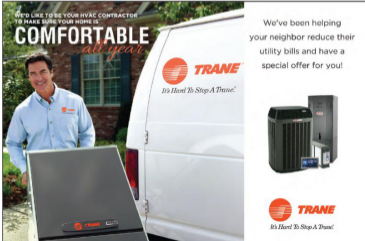 Our objectives are to build the Trane brand and your brand, and provide our dealers that participate in the LMG Program with enhanced Co-Op and Market Advertising Funds to drive quality leads to your company. Consider investing your Bonus Advertising, Co-Op, and Market Advertising Funds in the turnkey Additional Advertising Options via our 3 carefully vetted partners: BlueWing HVAC, Online-Access, and SearchKings. Which billing option do you prefer? I understand that by checking this box, I am acknowledging and agreeing to the terms stated above. I also understand that checking this box, completing the information below and clicking the NEXT button constitutes an e-signature that will be documented with the Gustave A. Larson Company to show that I have received and agreed to these terms. The Larson Company will issue a credit (based upon available funds) to your company.Your company does not need to submit a claim. Complete an Interest Form for the advertising options you are interested in and our Partner(s) will call your Advertising Contact to answer any questions and assist them with the options that best meet your company's advertising goals. To view samples/order, click this button. Social Presence Management We help keep you active on social media (5-10 posts a week) while notifying you of items that need your attention. Social Marketing Plus In-depth social media management including quarterly reports, boosting management, customized posts and much more. Nearby Now Review acquisition system improves website search ranking, ability to be found by consumers 10+ miles from your shop, and get more leads. PagePilot™ Managed Chat with ScheduleConnect™ 24/7 managed onsite Chat for your company website with ability to secure openings in next day schedule. Full-featured, content-rich mobile responsive website. 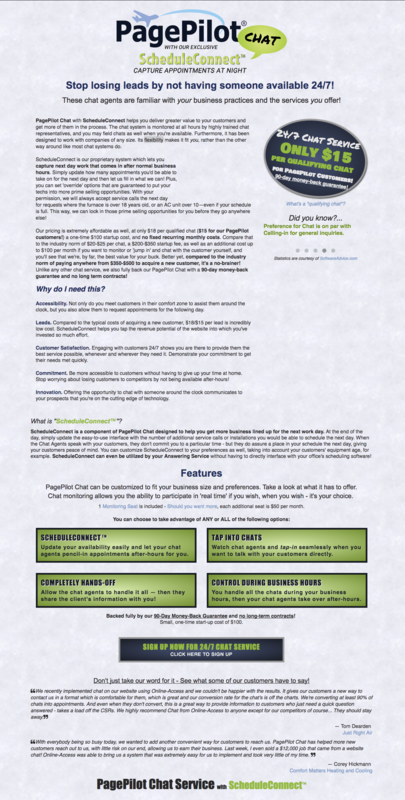 PagePilot™ Business Website Full-featured, content-rich mobile responsive website with ongoing local search engine optimization. 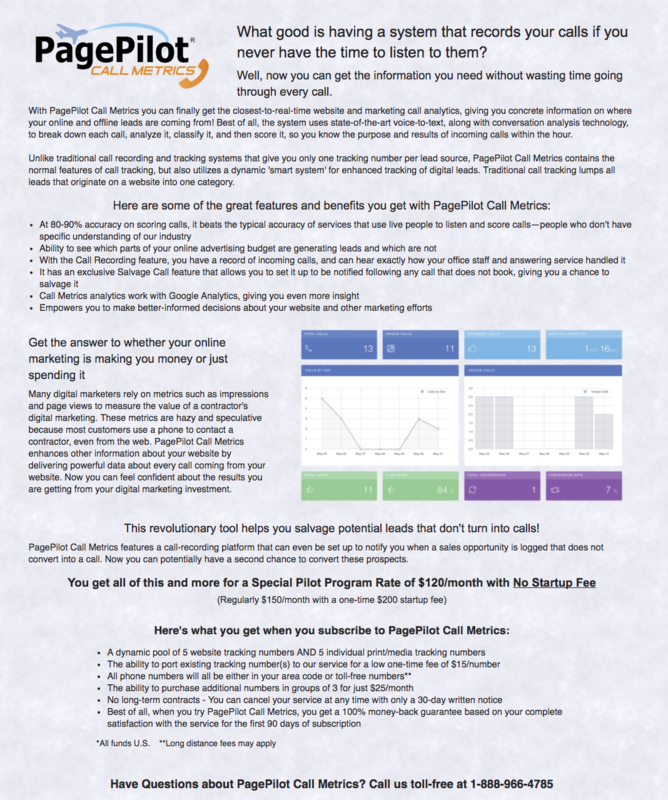 PagePilot™ Call Metrics Get independent, comprehensive data and analytics to see how people get to your site and what happens once they get there. To see samples/order, click this button. Click the options below to see a description of that service. Select the check box(es) of the direct mail options you are interested in. Your choices will be saved when you close this window. 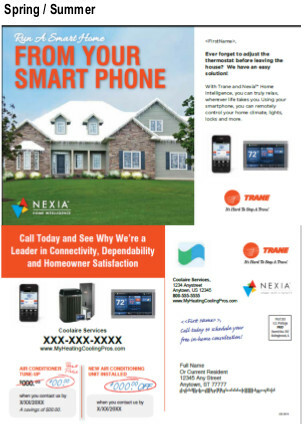 All of these direct mail pieces have been pre-approved by the Trane MAX Team. 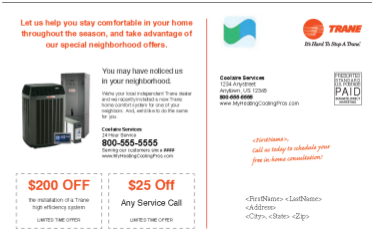 Michael Lenzi of BlueWing HVAC will call your Advertising Contact to answer any questions, obtain your coupon offers and expiration dates, and assist in downloading your customer database file & confirm your order. Click the options below to see a description of that service. Select the check box(es) of the marketing options you are interested in. Your choices will be saved when you close this window. Products eligible for advertising & co-op fund reimbursement are noted below. We help keep you active on social media (5-10 posts a week) while notifying you of items that need your attention. In-depth social media management including quarterly reports, boosting management, customized posts and much more. Review acquisition system improves website search ranking, ability to be found by consumers 10+ miles from your shop, and get more leads. 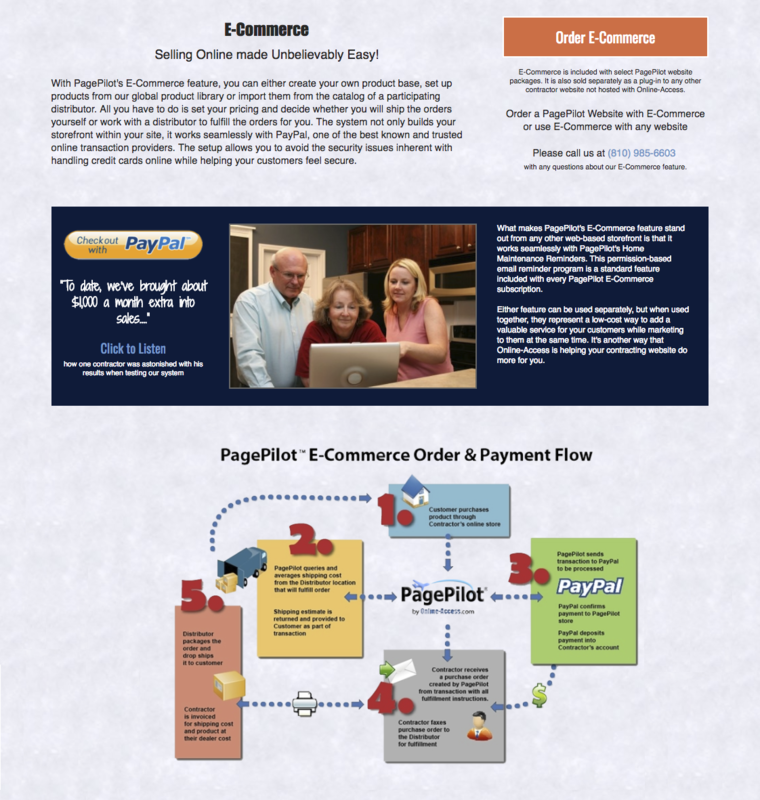 No startup fee if PagePilot or Wordpress Website. 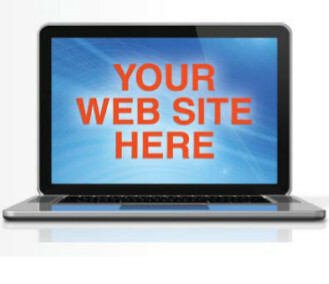 24/7 managed onsite Chat for your company website with ability to secure openings in next day schedule. Full-featured, content-rich mobile responsive website with ongoing local search engine optimization. Get independent, comprehensive data and analytics to see how people get to your site and what happens once they get there. An Online-Access team member will call your Advertising Contact to answer any questions and help identify products that best meet your company's advertising goals & confirm your order. All products eligible for advertising & co-op fund reimbursement. SearchKings will contact your Advertising Contact to answer any questions and help identify products that best meet your company's advertising goals & confirm your order. 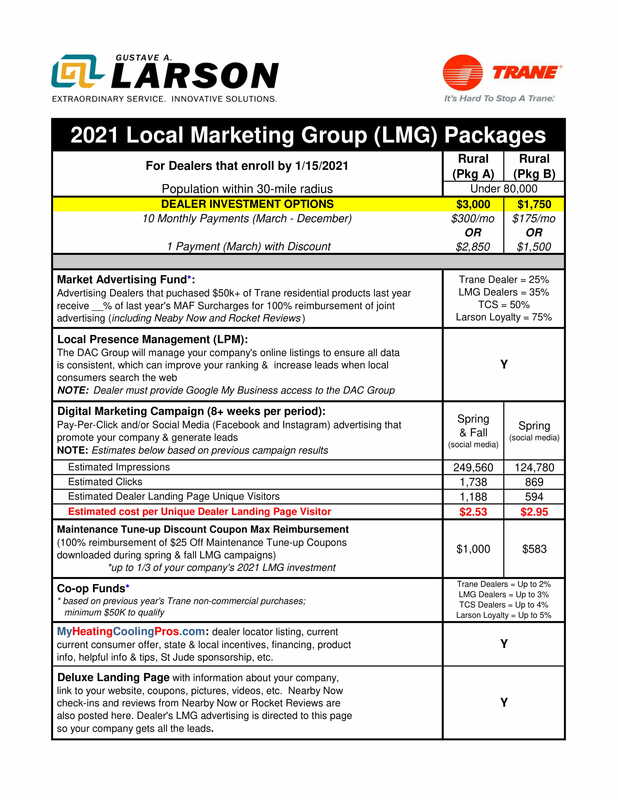 Send Customer Loyalty Newsletters in Spring, Summer, Fall and/or Winter to assist your company in retaining your existing customers and/or to prospect new customers. 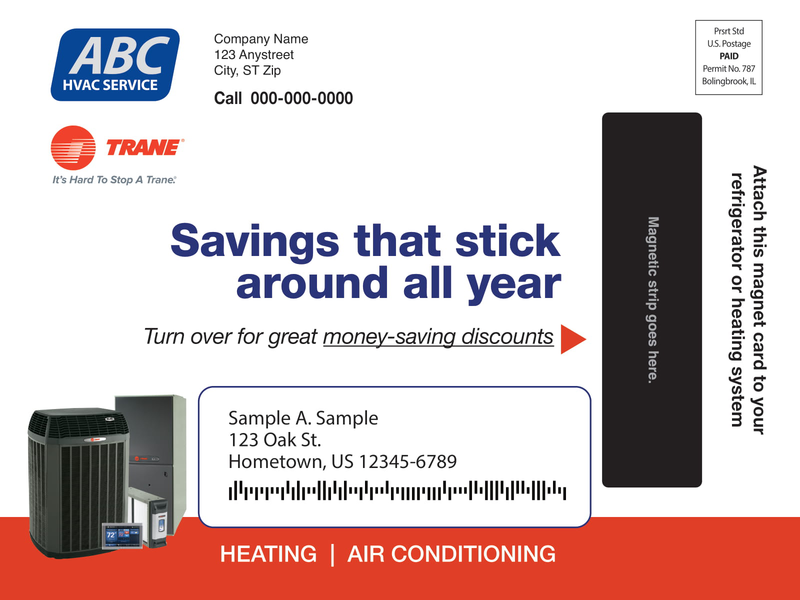 These 8.5" x 11" 2-sided color newsletters (folded once and inserted into a 6" x 9" envelope with cover letter) will promote discounts on "clean and check" services, new products, and the Trane consumer offer. The total number of newsletters is based on a minimum order quantity of 1,000. Price discounts are available for quantities exceeding 5,000 per mailing. *Campaign response rates will vary. Factors such as list mailed, coupon offers & expiration dates, and call conversion rate will contribute to overall success of campaign. 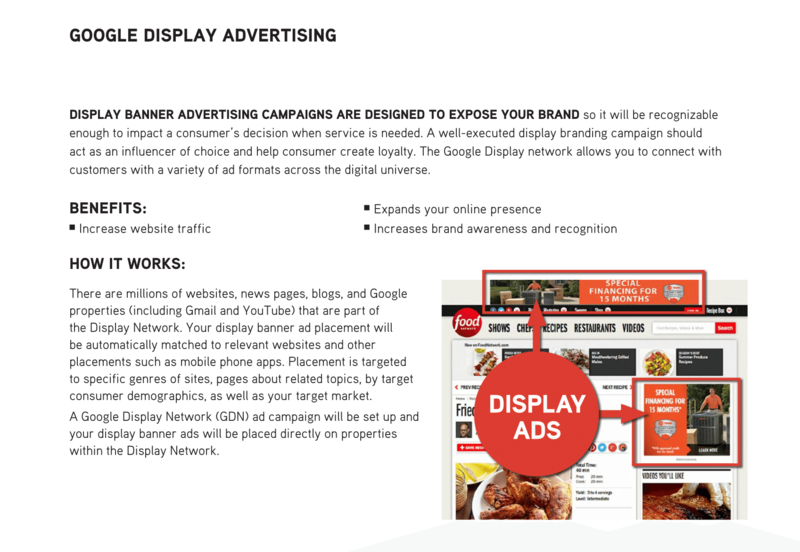 Mailbox advertising is a way for efficient consumer targeting and lead generation. Our eye catching materials provide ample space for delivering your message and have a longer shelf-life than many other media. 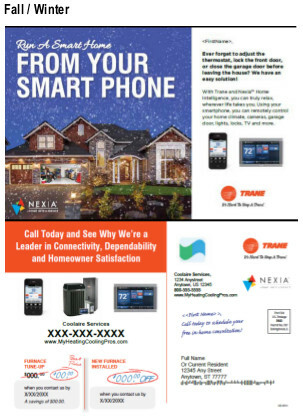 Mailbox advertising allows us to effectively target only those prospects who meet the Trane demographic criteria within your service area. 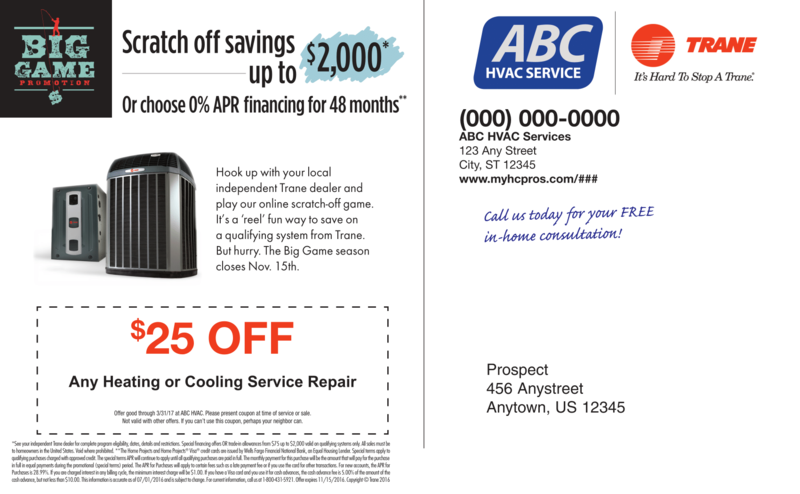 These 4.25" x 7" full-color direct mail pieces, which are typically mailed in late winter, have eight (8) coupon offers that can be utilized throughout the year, giving homeowners great incentive to place it on their refrigerator. Postcards come with a tracking phone number and analytics. For best results, mail these to your existing customers. Address data must conform to the SAMPLE DATABASE and CUSTOMER ADDRESS WORKSHEET provided. 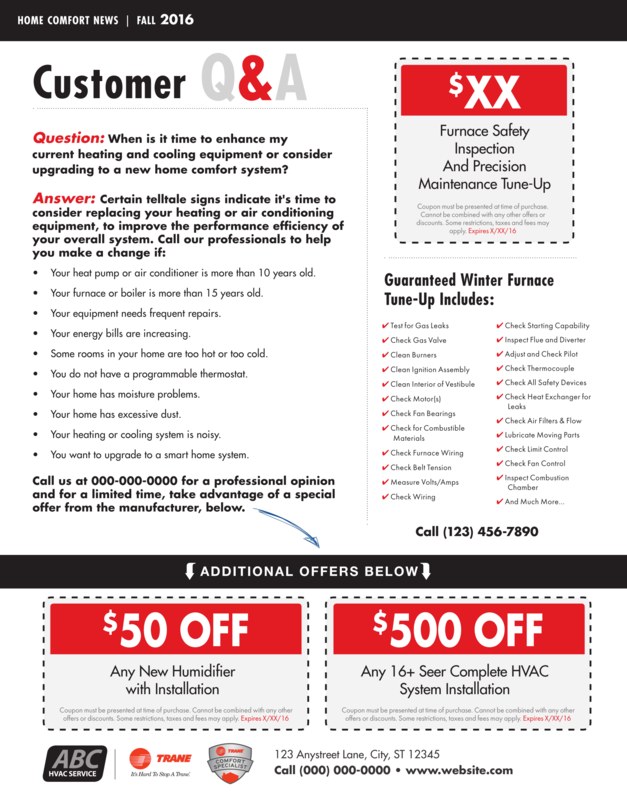 Michael Lenzi of BlueWing HVAC will work with your company to select the coupon offers and expiration dates. 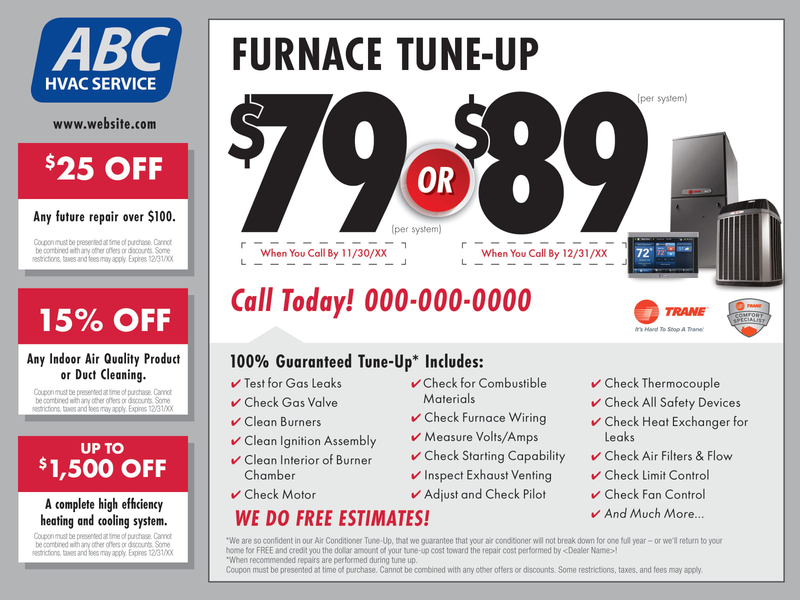 Get your customers in the maintenance state of mind! 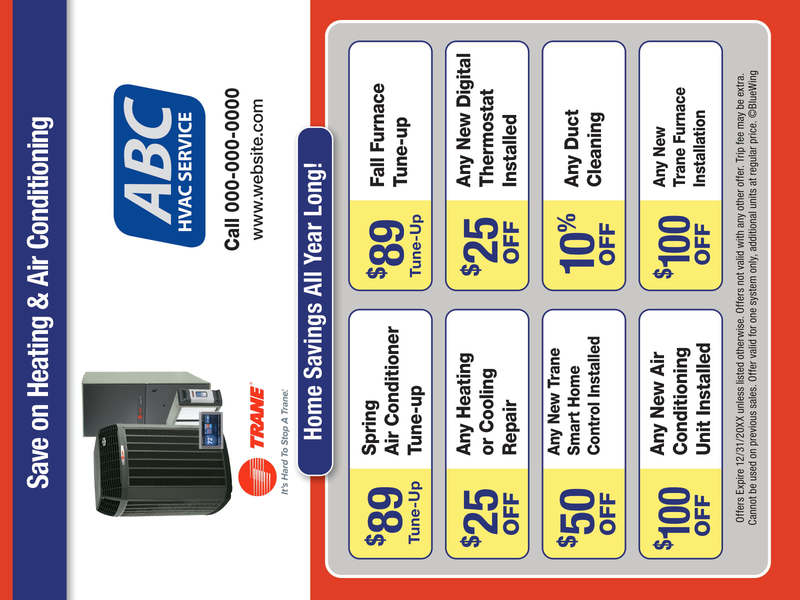 Help them to help you keep their HVAC systems in great condition by sending full color 6" x 9" maintenance reminder postcards in spring and fall to keep their attention. How aware are your customers of the services or specials you offer? Capture their attention with these full color postcards. Keep your name in front of them for easy access. BlueWing HVAC&apos;s turnkey maintenance agreement letter (8.5" x 12.5") has two maintenance plan options to differentiate the value your company provides to its clients. 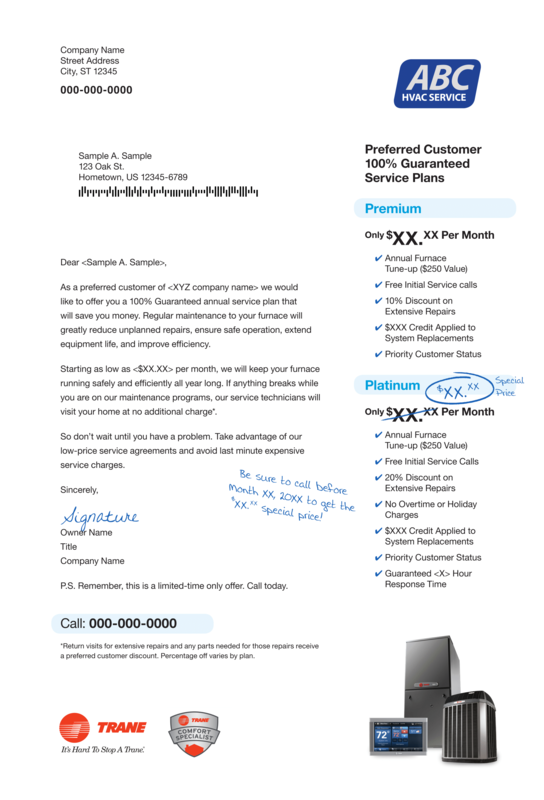 Maintenance Agreement Letters come with a tracking phone number and analytics. For best results, send these to your existing customers. Address data must conform to the SAMPLE DATABASE and CUSTOMER ADDRESS WORKSHEET provided. 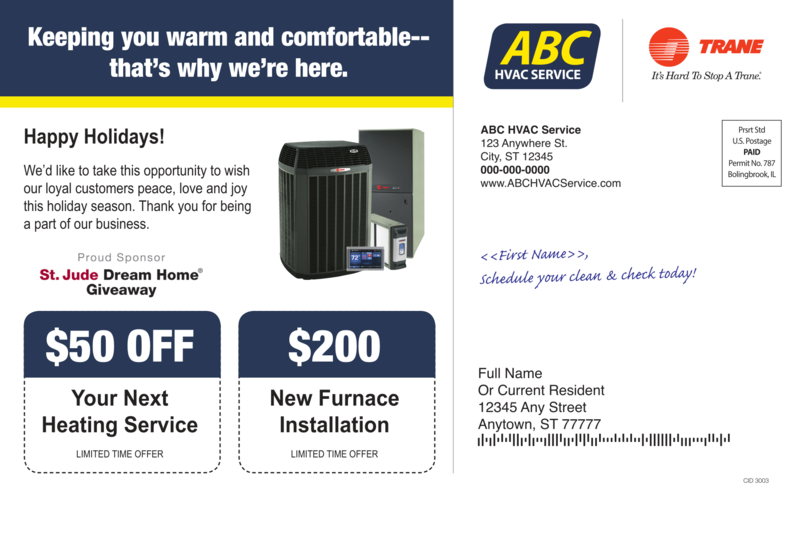 Michael Lenzi of BlueWing HVAC will work with your company to customize the letter. These 5.5" x 8.5" lightly-laminated high-gloss postcards with 2" x 3.5" magnets come with a tracking phone number and analytics. In 2015 and 2016, magnet mailers averaged more than a 1.09% response rate for prospects. For best results, send these to your existing customers. Address data must conform to the SAMPLE DATABASE and CUSTOMER ADDRESS WORKSHEET provided. 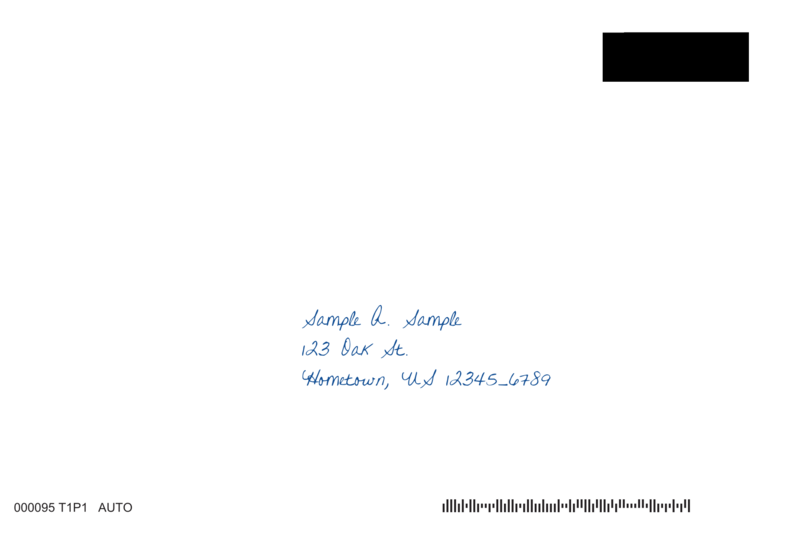 Michael Lenzi of BlueWing HVAC will work with your company to customize the letter. Laminated postcards are proven to draw a better response than standard postcards. BlueWing&apos;s laminated postcards feature a tear-off gift card on a heavier, laminated stock that engages the recipient. The card easily fits in a wallet and can remain there until the need for a repair or maintenance arises. These 6" x 4.25" laminated postcards come with a tracking phone number and analytics. For best results, send these to your existing customers. Address data must conform to the SAMPLE DATABASE and CUSTOMER ADDRESS WORKSHEET provided. Michael Lenzi of BlueWing HVAC will work with your company to coupon options and expiration dates. The buzzwords "Internet of Things" and "Smart Homes" have been talked about inside and outside the HVAC industry lately, even appearing in The Wall Street Journal and on the cover of Time. It's fair to say most consumers are aware of the trend, and as they start to expect more out of their HVAC equipment, they'll also expect more from their contractors. Research shows that HVAC contractors need to get their collective arms around this technology, lest they be left behind. 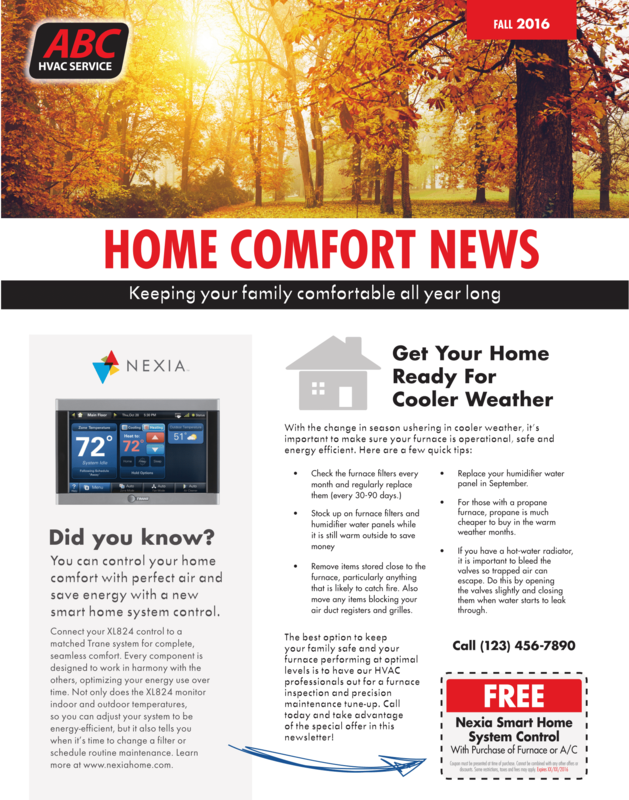 Send Nexia post cards any time of year to tap into the $7.5 billion home automation and control market, which is forecast to grow at a compound annual growth rate of 11.36% between 2014 and 2020, and reach $12.81 billion by 2020*. * According to a new market research report published by MarketsandMarkets. The buzzwords "Internet of Things" and "Smart Homes" have been talked about inside and outside the HVAC industry lately, even appearing in The Wall Street Journal and on the cover of Time. It's fair to say most consumers are aware of the trend, and as they start to expect more out of their HVAC equipment, they'll also expect more from their contractors. Research shows that HVAC contractors need to get their collective arms around this technology, lest they be left behind. Home automation is poised to become more accessible than ever before. The home automation and control market is forecast to grow at a compound annual growth rate of 11.36 percent between 2014 and 2020, and reach $12.81 billion by 2020, according to a new market research report published by MarketsandMarkets. Home automation centralizes control of a residence's HVAC, lighting, appliances, and other systems. The homeowner benefits from improved convenience, comfort, energy efficiency, and security. The global home automation and control market was worth $5.77 billion in 2013. Even though the home automation concept has existed for quite some time, the market has witnessed significant growth, mainly during the last five years. The growing awareness of wireless technologies and the integration of wired and wireless technologies is expected to propel the home automation and control market forward. 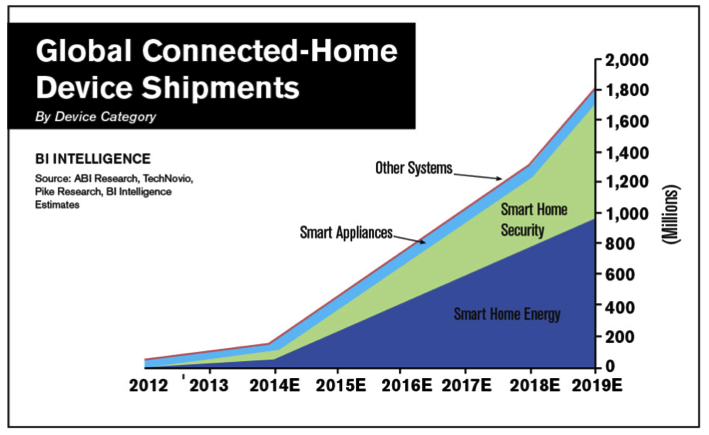 North America is expected to retain its position as the largest consumer of home automation products, supported largely through a revival of new construction and renovation activities. As consumers' appetites for convenience, connectivity, safety, security, efficiency, and green product solutions continue to thrive, the market will continue to expand. Energy management and HVAC automation systems are expected to experience similar growth during the forecast period. High investments in building infrastructure and the need to reduce power consumption to save energy are further expected to drive the global demand for home automation systems, especially in Asia-Pacific, Europe, and North America. Question 1: What is the difference between a smart thermostat and a connected thermostat? Answer: A connected thermostat is one that is connected to the Internet and can be controlled by a device, such as a smartphone or tablet. A smart thermostat is one that is connected to the Internet but can also make heating and cooling adjustments based on some homeowner input, but also algorithms or other inputs. These smart thermostats give homeowners unprecedented control over their indoor climates and access to data about system performance, energy savings, and more. These developments have helped make thermostats one of the fastest-growing segments of the HVAC industry. In 2014, about 15 percent of the thermostats shipped in North America were connected and 12 percent were smart. The rest were traditional thermostats that are unable to connect to the Internet. Question 2: How can HVAC contractors "own the home" instead of being in a situation where they're the ones being subcontracted out? Answer: Contractors need to make the conscious decision to embrace technology. Security dealers, cable operators, and custom integrators are among the groups chasing this business, and all want the thermostat to be part of their portfolios. 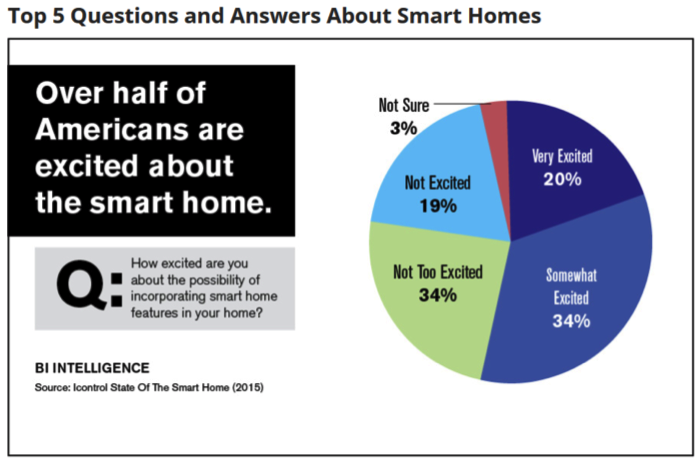 More than half of consumers are excited about the smart home and want help with installation. The HVAC industry is poised to benefit from this trend because the traditional business and equipment can provide one of the biggest tangible benefits. HVAC contractors are already in customers' homes and are well-equipped to install these products. Contractors need to embrace the trend and not be sidelined. With so much information available online, contractors need to be sure that they know more than their customers. Questions 3: A lot of contractors know the smart home is the future, but they have no idea how to begin. Where do they start? Answer: Keep it simple, but decide to be in it. Start with one great product and build from there. The easiest place to start is probably with a thermostat. From there, contractors can add items like smoke and carbon monoxide (CO) alarms, Wi-Fi security video cameras, etc. It can certainly be overwhelming at first, but the same can be said about a lot of HVAC products. Question 4: How do contractors know their customers' personal information is safe? Answer: There has been some concern from consumers about allowing HVAC companies access to this information, but are HVAC techs any different than cable techs? The best solution is to ask thermostat manufacturers for their privacy policies and pass that information on to homeowners. It's the contractor's job to make sure customers are comfortable and have all of their questions answered. It's important to remember that consumers own their data. Manufacturers have been given the right to use the data to further the offering and will often offer homeowners the option to share that information with an installing contractor if it's convenient or productive for them. Question 5: How do you sell these products to homeowners? Answer: This is where the buzz about smart homes works in a contractor's favor. Most products require dealers to educate customers and push to close a sale. That is not necessarily true for smart thermostats. A strong consumer pull has already been established with these products. In addition to convenience, the proven energy savings is a great sales tool. Smart thermostats save U.S. customers about 10&dash;12 percent on their heating bills and about 15 percent on their cooling bills. That is a $130&dash;$145 savings a year, on average. Since a smart thermostat costs around $250, the device typically pays for itself in about two years. Thank your existing customers and help them remember your company this Thanksgiving & Holiday Season. Holidays are made for building relationships. Especially during this time in our country when people are looking for stability and relationships. 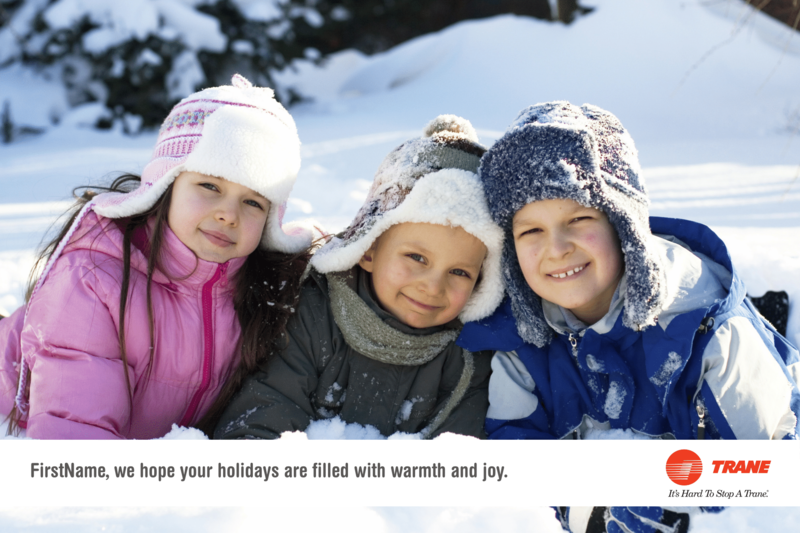 Holiday Postcards are a fantastic customer retention tool. Plus, it puts your name in the minds - and on the mantles - of thousands of customers. These 6" x 9" postcards come with a tracking phone number and analytics. For best results, send these to your existing customers. Address data must conform to the SAMPLE DATABASE and CUSTOMER ADDRESS WORKSHEET provided. Michael Lenzi of BlueWing HVAC will work with your company to coupon options and expiration dates. End the year strong by showing appreciation to current customers. This piece says thank you to customers and promotes 3 of your best offers of the year. Thank You Letters come with a tracking phone number and analytics. For best results, send these to your existing customers. Typical response rate is 1.0% with an average cost per lead of $43.50. Address data must conform to the SAMPLE DATABASE and CUSTOMER ADDRESS WORKSHEET provided. 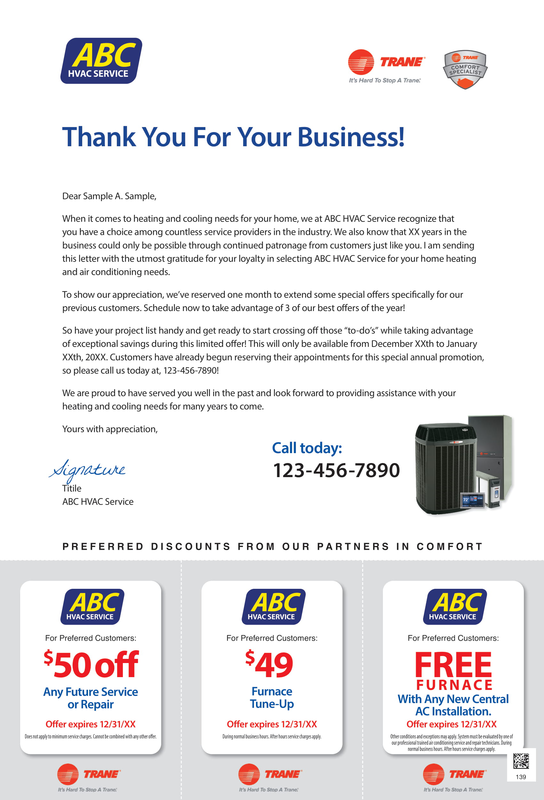 Michael Lenzi of BlueWing HVAC will work with your company to customize the letter. Are You Being Found in the Cities You Service? Get more online reviews and explode your local search results at the same time! Watch the 15 minute video on www.NBNReviews.com. 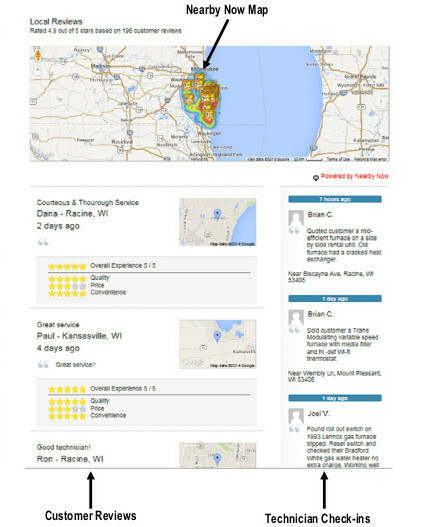 Nearby Now is a Reputation Marketing and Online Reputation Development tool. It enables active reviews, solicitation/proliferation and dynamic service summary check in which helps your business capture the goodwill of your current clients and leverage them to generate future leads. The dynamic review and keyword-rich summary content can then be used on your PagePilot website to yield huge SEO gains. This is the new best practice for local service businesses redefined. Nearby Now is applied to both your company website and your MyHeatingCoolingPros.com Dealer Landing Page to maximize SEO of both sites. Based on organic searches performed by consumers, Nearby Now users had an average cost of only $9.63 per unique viewer to your company website and LMG landing page. The Economy Class web package does not include ongoing localized on-site and off-site search engine optimization, Nearby Now review system and city pages. Please note that this website must be dedicated to promoting your dealership and Trane. 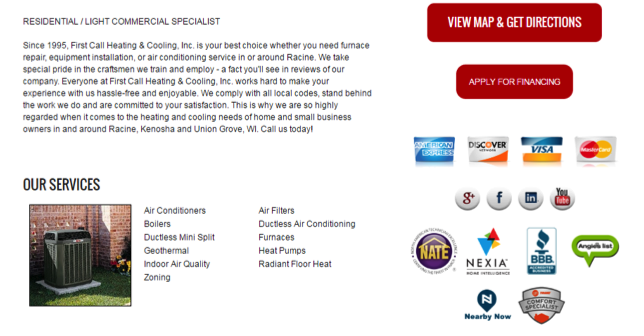 Brands that are in direct competition with Trane cannot be featured on this website. The Business Class web package does not include Nearby Now review system and city pages. 1/4 page black & white newspaper ads individually tagged with your dealership and list your tracking phone number and abbreviated land- ing page URL. On the online Ad LMG registration portal, please indicate your prefer- ence for the newspaper (and zones if applicable) where you want your ads to appear. Your company will have 3-5 business days to proof each ad to verify all information is correct. The number of insertions is based on the minimum investment $3,000. You may upgrade your investment level by increments of $1,000 which will proportionately increase the number of insertions. Homeowners hearing the Trane message over and over, and being per- suaded to take action... these are the primary objectives of our consumer promotion. And radio delivers big time, reaching prospects in the car, at work, at home &dash; virtually anywhere. Radio provides high impact with music, voice over, and a compelling story line to break through and grab people's attention. 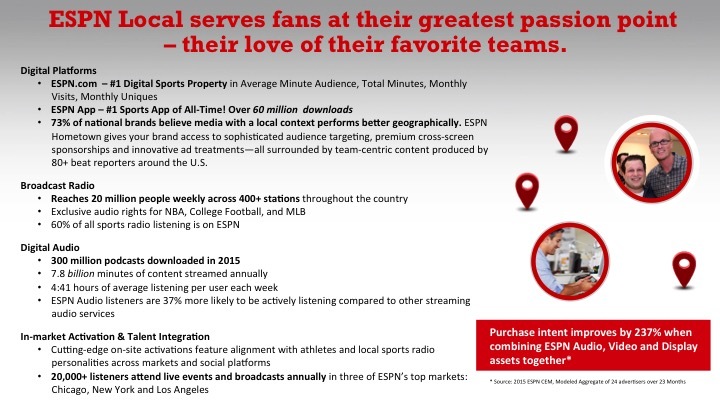 Your individually tagged radio spots will be placed in the most effective stations and time periods, maximizing both reach and frequency among the Trane target audience. Your company will have 3-5 business days to verify all information and pronunciation is correct. Click HERE to hear a sample of the radio ad. Please make sure your audio is turned up in order to hear the clip. Nothing touches consumers on as any levels as TV. 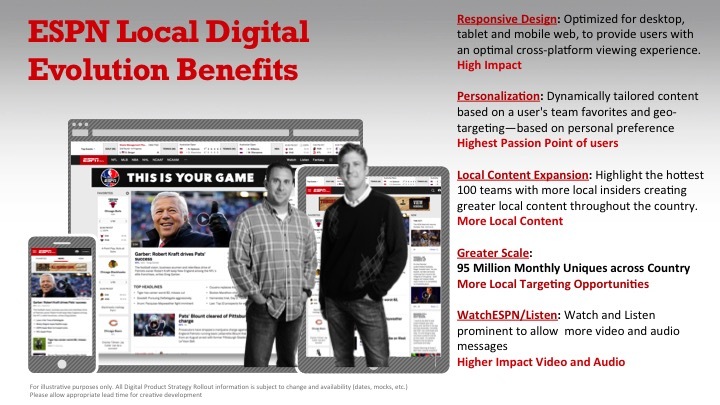 Sight, sound, text, images, motion ... all in a dynamic and prominent format. In fact, the average viewer spends a whopping 36 hours per week engaged in this medium. 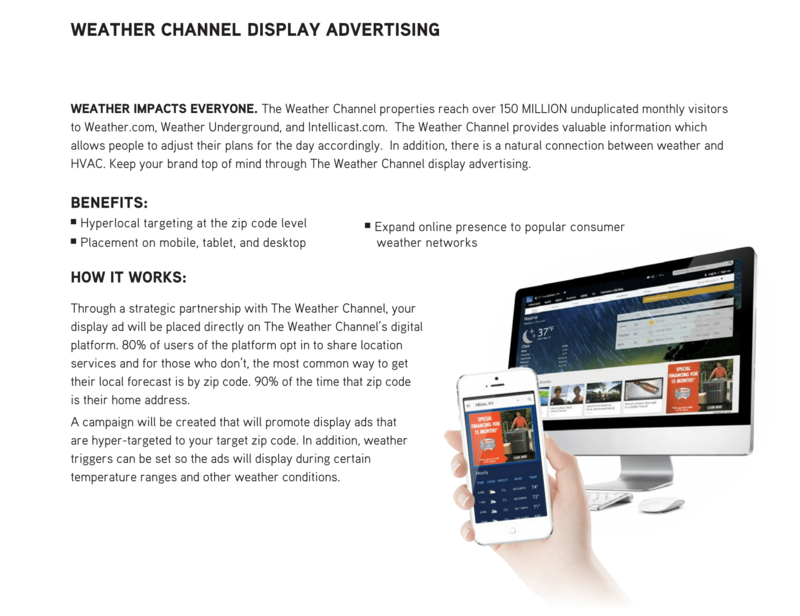 The opportunity for mass reach and high frequency for an ad- vertising message is huge! 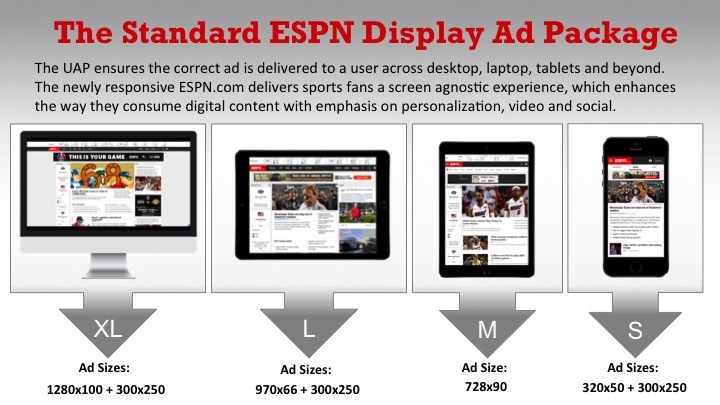 Your individually tagged TV spots will air in the most effective stations and time periods in order to maximize exposure to our target audience. 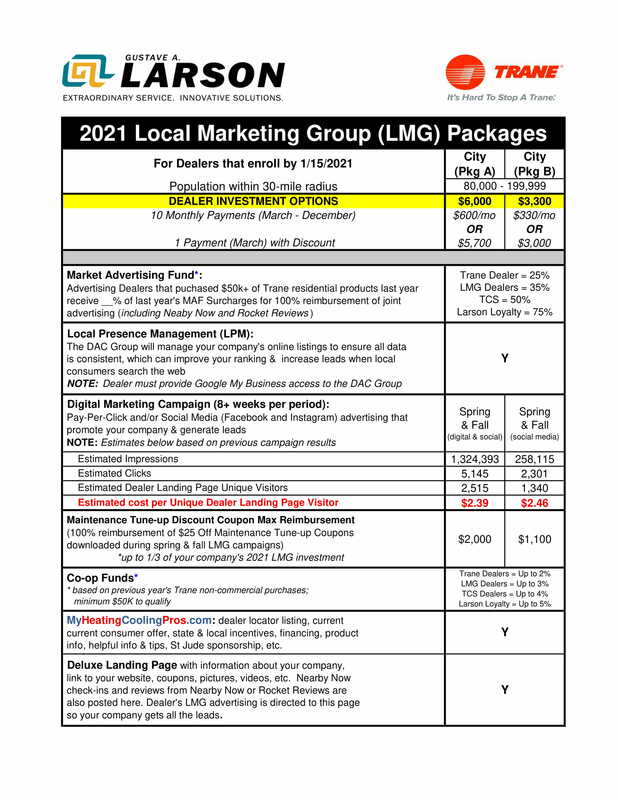 LMG participants receive their own landing page, which allows each dealer to have information about their company, coupon offers, pictures & videos, Wells Fargo financing link and a Contact Us form. The Dealer Landing Page can be listed on dealer-specific advertising. 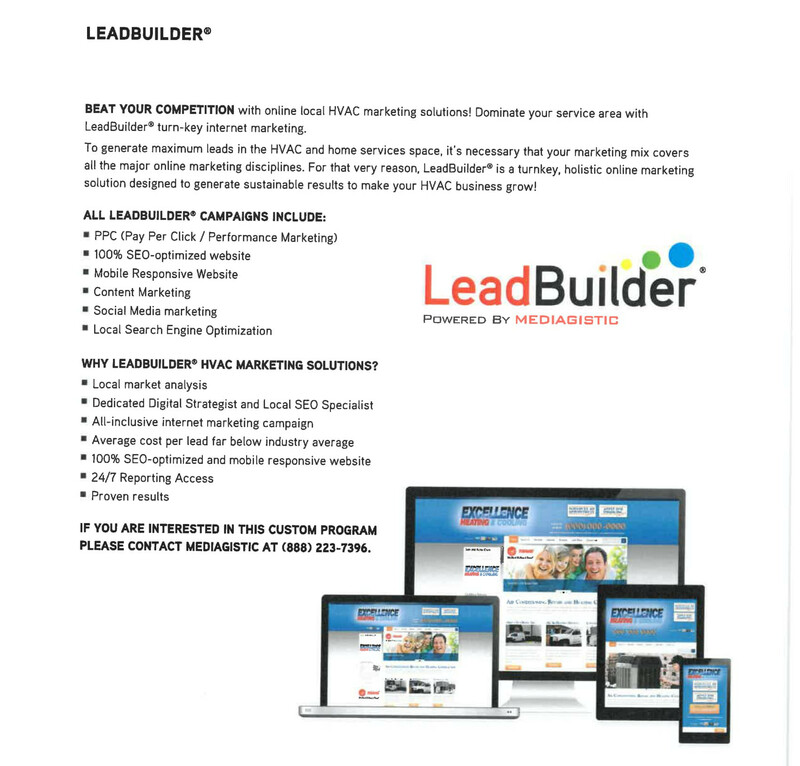 Consumers who go to your Landing Page can visit all of the LMG website pages... except the Dealer Locator (protecting your leads). LMG dealers can "cross link" their website to their Dealer Landing Page to improve the SEO of their Landing Page and allow consumers who visit their company website to connect to their Landing Page and view all the information on the LMG website except the Dealer Locator. 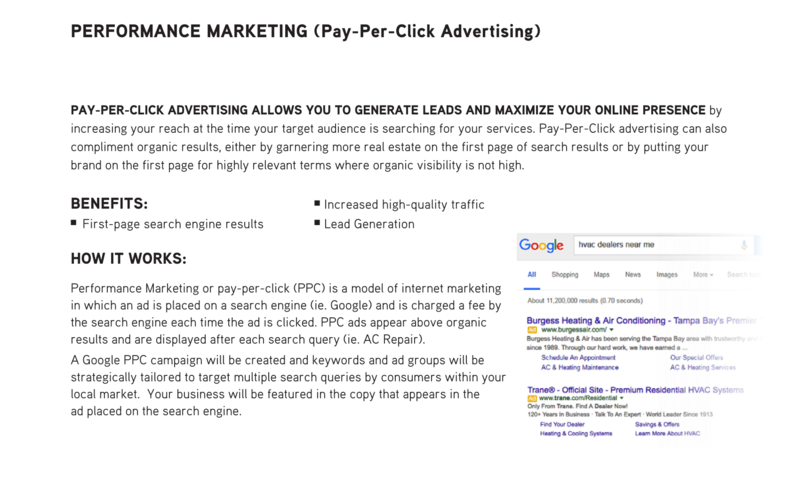 Based on organic searches performed by consumers, Nearby Now users had an average cost of only $12.00 per unique viewer to their company website and LMG landing page. 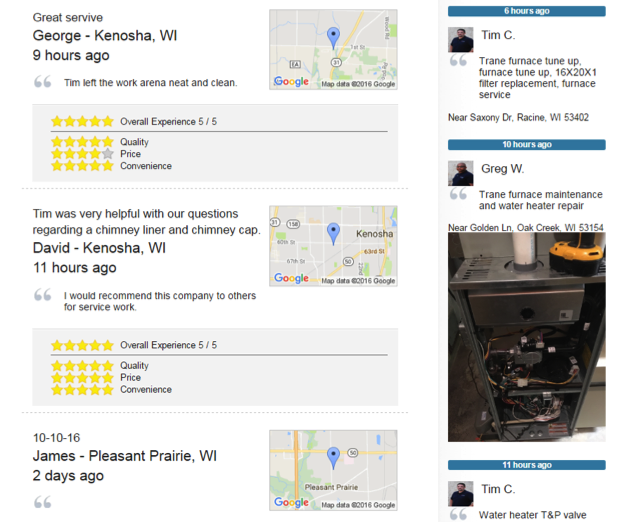 Dealers that sign up for Nearby Now have technician check-ins and customer reviews posted both to their company website AND their dealer landing page, increasing their opportunity to be found by local homeowners performing online searches. The screen shots below demonstrate what this looks like. The 'Control Your Own Advertising' option is only for TCS dealers. If you are a TCS dealer and you are seeing this message, please use the button below to go back to the Dealership Information section and be sure to enter a TCS number and level in order to be able to choose this option. Otherwise, hit continue below to pick another option. Below you will find a list of products that you have chosen as bonus advertising options. Please confirm these selections and hit either the 'Confirm' button to continue, or the 'Cancel' button to return to option selection.